Dermal Fillers are Injectable filler used to fill wrinkles & creases in the skin. In the era of perfectly sculpted faces and bodies dermal Fillers now bridge the gap between perfect and almost perfect in a matter of minutes. Dermal fillers are made up of Hyaluronic acid which is a naturally occurring sugar found in our body. It can be used to smoothen out wrinkles, scars, dents and also shape and restore volume in areas such as the cheeks, lips and hands. What is involved in Dermal Fillers ? After a thorough consultation, your medical practitioner will determine the correct filler type and quantity you’ll need for your desired effect. 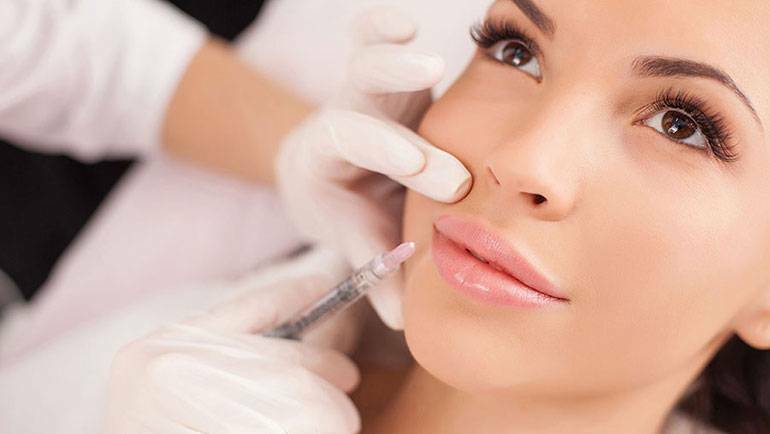 This is followed by a quick noninvasive procedure whereby the filler is injected into skin in small quantities creating a plumping and hydrating effect with results being seen immediately. Anaesthesia isn’t required but should you wish we can apply local anaesthetic cream to the area. Results will last around 6-12 months on average after which the filler will slowly dissolve naturally, causing no harm to you. Nose to mouth lines – corners of the mouth. Lip enhancement – volumising and shaping. Smokers lines. Deep line rejuvenation. Cheek augmentation – volumising and shaping. Rejuvenation of the hands. Severe allergies, infections around treatment area, pregnant or breastfeeding. Avoid exposure of treated area to high temperatures such as using the sauna, steam, gym, drinking hot drinks (lip treatment). Avoid touching or rubbing the area for 24 hours after your treatment. Drinking lots of water for 24 hours after treatment will help the treated area gain further plumpness.